Although I've been playing a wide range of games lately--turn your attention to the "Now Playing" section to the right for proof--the one I've been spending the most time with this week, surprisingly enough, is Osawari Tantei Nameko Daihanshoku (aka Touch Detective: Funghi's Big Breed). It's basically Zoo Keeper, with a couple of twists--If you've ever played Zoo Keeper, you've basically played Funghi's Big Breed. Well, kind of. The big addition to this game is that if you align four tiles in such a way that they form a square, something that looks an awful lot like a bodybuilder Funghi (that's the name given to the little mushroom characters in this game, by the way) erupts onto the screen and wipes out not only the tiles that started the whole thing but the 12 tiles that surround them, too. Oh, and if you align four tiles in a row, a wolf-like Funghi zips across the screen and takes out the entire column of tiles to the left or right (or above and below, if the aligned tiles are vertical rather than horizontal). Anyway, both of these changes add a nice bit of zip and even drama to the experience and help differentiate Funghi's Big Breed from its predecessor. Its art style is all sorts of awesome--Although the main reason I decided to buy Funghi's Big Breed earlier this year was that its gameplay apes (for the most part, at least) that found in Zoo Keeper, another reason was its darkly adorable art style. 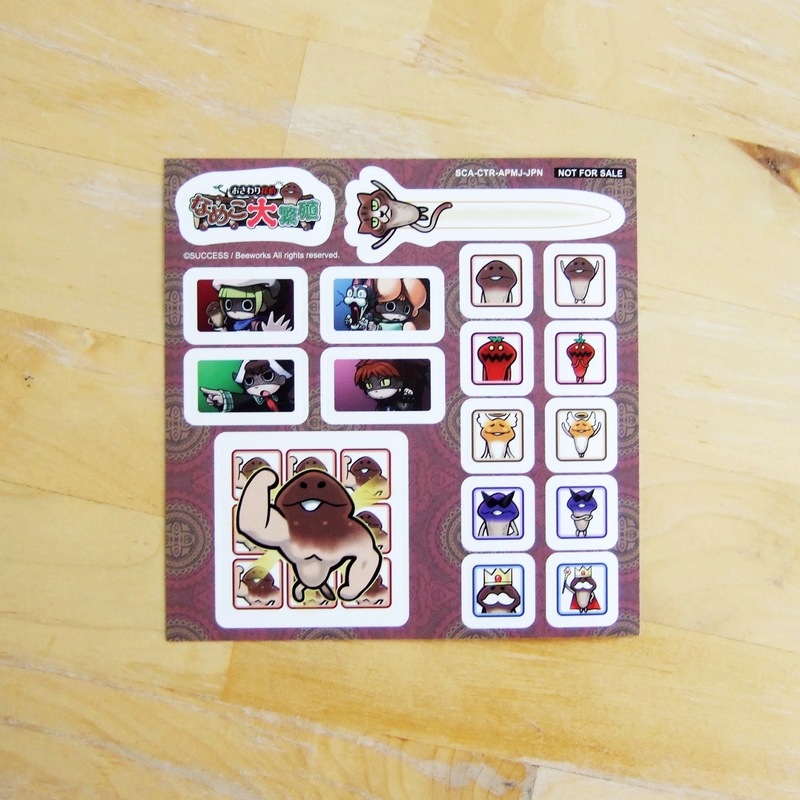 Plus, I have a sort of inappropriate affinity for the Touch Detective series' Funghi characters. It's got a great, boppy soundtrack--For me to consider a puzzler "top tier," it has to have a soundtrack that makes you tap your feet while also making your pulse race. Funghi's Big Breed succeeds at accomplishing both--although I wouldn't have complained if the folks at developer Success had produced a few more tunes (as they did in Zooo, the GameBoy Advance/PS2 version of Zoo Keeper). 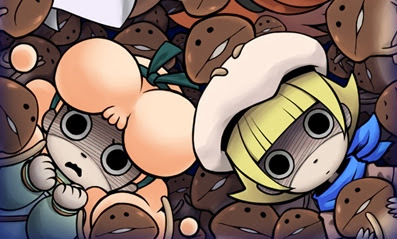 It's a bit lacking in terms of modes--My only real complaint with Funghi's Big Breed at the moment--well, besides the fact that I think I prefer Zoo Keeper's slower pace and more limited rule set--is that it's a little thin when it comes to the number of modes it offers players. 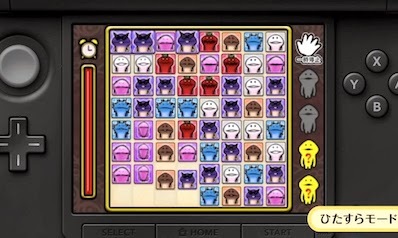 There's a "simple" mode (where all possible "matches" are constantly visible), an "earnest" mode (possible matches only become visible at certain points) and a challenge mode (where players are tasked with meeting specific requirements, such as capturing a certain number of one kind of Funghi or creating a certain number of chains). For me, the simple mode is too, well, simple, while I've never been a fan of challenge modes in such games, so the only one I'm making use of right now is the "earnest" mode. Although it's a lot of fun, I wish Success had thrown in a "time attack" or even "Tokoton" (collect 100 of a single type of Funghi, a la Zoo Keeper) mode as well. 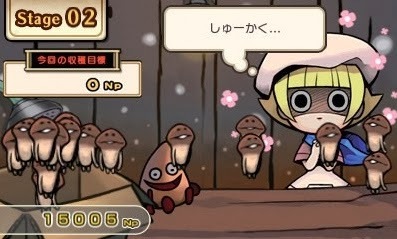 So, there you have it--my impressions of Touch Detective: Funghi's Big Breed (aka Osawari Tantei Nameko Daihanshoku). Sorry a few of the bullet points above are on the long-winded side. Also, be on the lookout for an actual Great Gaymathon review of this game in the next few weeks. And, yes, that's despite the fact that I don't yet own a Vita. 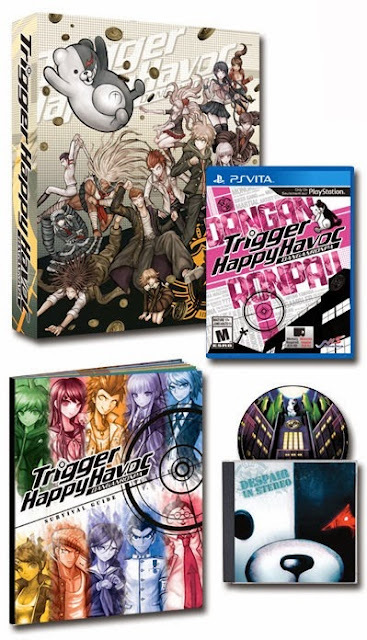 Making matters worse is that Danganronpa: Trigger Happy Havoc's limited edition is just $10 more than the regular release (which will carry a $40 price tag), even though it includes an appealingly designed collector's box, a soft-cover art book and a jewel-cased soundtrack. Thankfully, it seems I'll be able to hem and haw about this decision for at least a little while yet, as neither version of Danganronpa: Trigger Happy Havoc will hit the streets until Feb. 11, and at the moment more than 75 percent of the limited edition's stock is still available. Have any of you already staked a claim to one of these beauties, or are you considering doing so at some future point in time? 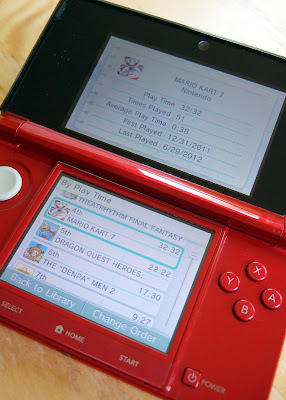 I sadly can't remember exactly who it was, but someone on Twitter last week prompted me to take a look at the amount of time I've spent with my most-played 3DS titles. In case you can't make out the game titles and play times showcased in the admittedly crappy photos above, here they are: Animal Crossing: New Leaf (488.26 hours--uh, yikes! ), THE "DENPA" MEN (42:51), Theatrhythm Final Fantasy (33:38), Mario Kart 7 (32:32), Dragon Quest Heroes: Rocket Slime (22:22) and THE "DENPA" MEN 2 (17:30). 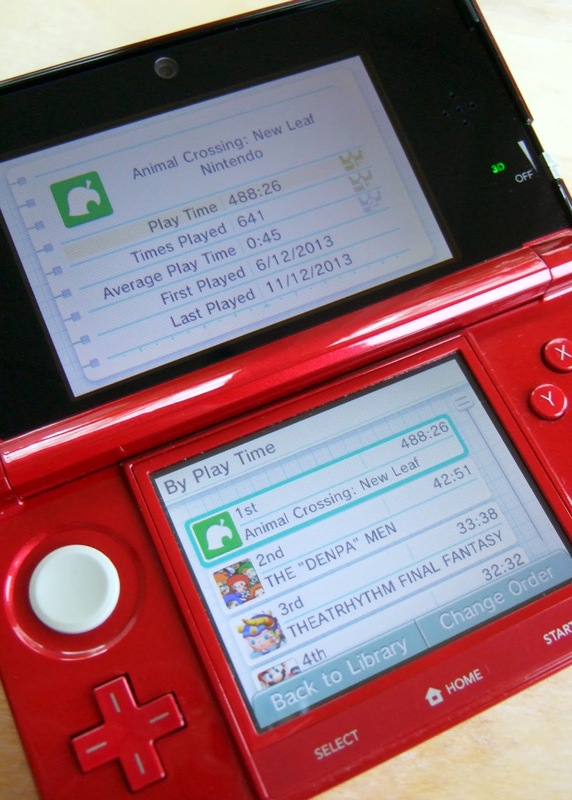 What are all of your most-played 3DS titles at the moment, if you're willing to share? Before today, I could've envisioned a couple of game series being successfully combined artistically with Kirby--Mario and Pokémon among them--but The Legend of Zelda? Not even a consideration for me--until I came across the example below, of course. The Zelda elements all can be found within the giant Kirby, by the way. Some are images while others are text. 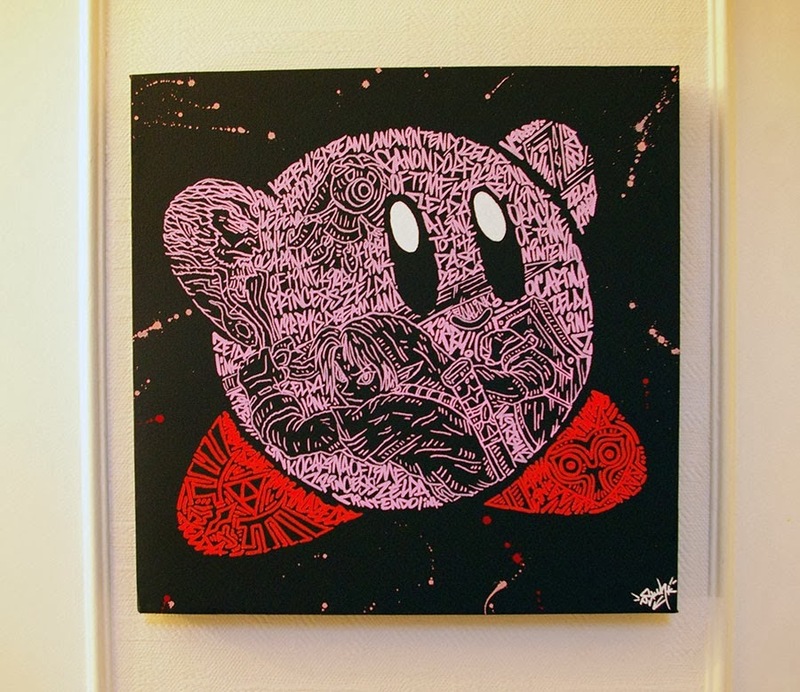 This painting--made using posca, which is supposed to be some sort of water-based marker--is yet another product of artist and blogger Oskunk, by the way. To see more samples of his work, check out custom-art.blogspot.com.